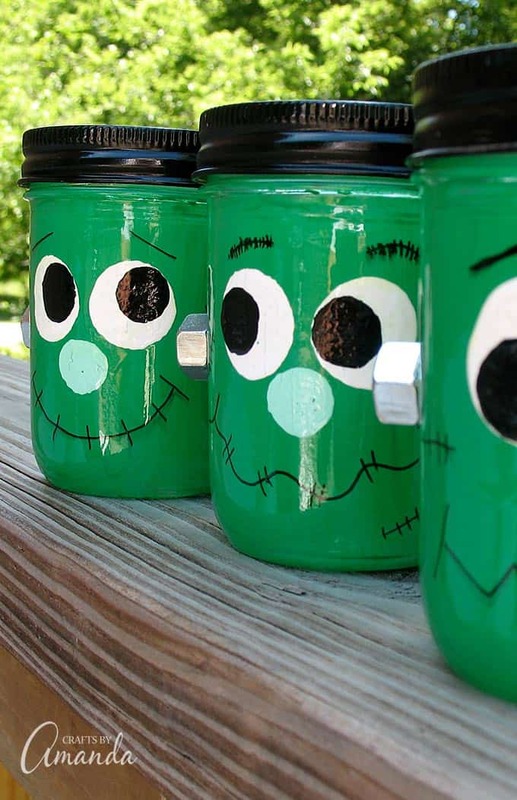 With a little green paint and some craft time, these mason jars become Frankenstein luminaries with this fun Halloween craft project! What happens when you take a little bit of time for Halloween crafting, adding in some mason jars and a bit of paint? You end up with the cutest Frankenstein Luminaries ever! 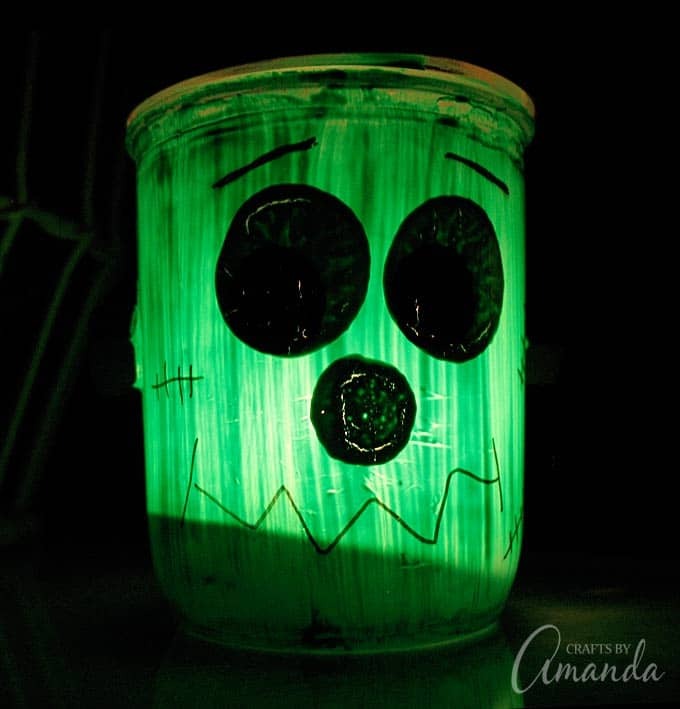 Amanda has really made some cute Halloween luminaries and I’m so glad she’s sharing the tutorial. 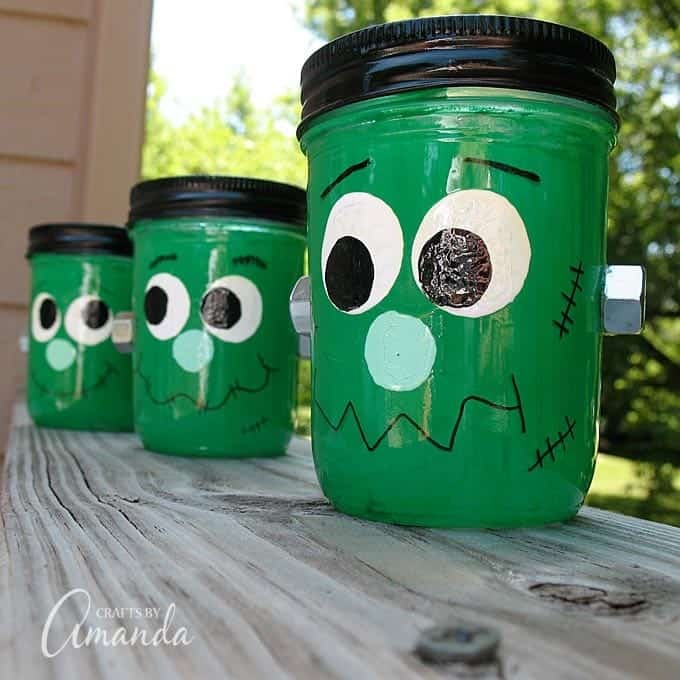 Not only would these Frankenstein Luminaries look super cute as they sat out during a Halloween party but these would also make GREAT take home souvenirs for kids at the party! Either already made or if you have space and time, maybe this is something that kids could make during a Halloween party! Heck, I would have loved to make something like this when I was little at a Halloween party. Not only are these Frankenstein Luminaries super cute during the day but they also look pretty neat at night! Look at Frankenstein lighting up! Kids will love making these Frankenstein faces because they are so easy. You can make several different variations to create different expressions just by changing the eyebrows and smiles. Amanda has the entire photo step by step tutorial on her blog plus tips and trick as well as a printable supplies list! Amanda blogs and creates at Crafts by Amanda! Amanda is the crafty, entrepreneurial mother of four children. She loves to bake, cook, make kid’s crafts and create decorative items for her home. She is a crafting expert and guru in the kitchen and has appeared online and in print publications many times over the years. She is also the editor for the Home & Garden channel at Craft Gossip and owner of FunFamilyCrafts.com.